Almost two years ago, I was privileged to travel to Singapore to speak at the 2013 Asian Festival of Children’s Content. I met authors and illustrators from all over the Pacific Rim countries and beyond. For Day 12 of Christie Wild’s PB 14:14 Challenge, I’m offering one of the books by author/illustrator Christopher Cheng. Not only is he an amazing creator of children’s content, he’s also a stellar speaker at events all over the world – he’ll be presenting at the NESCBWI Conference in Chicago this April…wish I could go! I just don’t want to stop…do you? The author offers us a delightful buffet of phrases that vividly portray all the places we find water. He plays with words with the skill of a basketball champion dribbling a ball – he puts words together that evoke amazing images in our minds. The beautiful watercolor and acrylic illustrations perfectly connect with the simple, yet evocative text and even the end papers follow through with the watery theme of the book. It’s not an easy book to get, but you can click on the link to Chris’ website for more information. 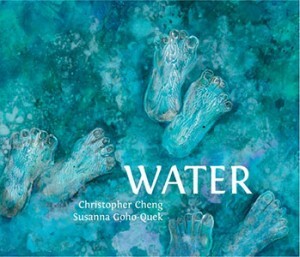 This entry was posted in Christie Wild's PB14:14, Top Ten Elements in Picture Books and tagged 2015 NESCBWI, Water by Chris Cheng, Word Play by viviankirkfield. Bookmark the permalink. Sounds truly lovely, Vivian. And the cover is gorgeous! Vivian, Thanks for posting Top Ten Elements. They clearly illustrate all the ways to revise our manuscripts. Adding a bit more tension/conflict to one of mine now. Picture Book author, Vivian Kirkfield, has allowed this reblog of her excellent post today. Wanting to write YOUR BOOK? Check this out. Flowing liquid word play…love it. Thanks for noting this one, it is beautiful. I’m glad a PB makes us think about water in a poetic way. Beautiful words and I can imagine that the illustrations inside are as stunning as the one on the cover. Sounds gorgeous! Have you read the brand new Water Rolls, Water Rises? I so love when an author uses phrases as this one does. I use to have my students do this when writing poetry. Can’t wait to read this one. Sounds like a delightful book! But also, your description of it is lovely! Oh Ellen, you are very kind. 🙂 It is a beautiful book! Wonderful images. Wouldn’t it be nice if we had an international library? Some libraries participate in the InterLibrary Loan, Sydney…our local library in Colorado Springs did…you could ask for a book that was only available in London or France or wherever…if you were willing to pay the postage, you might get it. My hubby used to get books from all 50 states…those they sent for free. What a beautiful book! Thank you for sharing :). the cover grabbed my attention immediately. The text is poetic. Perfect combo.